Rose and I have had a lovely few days, pouring over the Heirloom Roses catalogue, planning our purchase. While Lucy enjoys helping her dad in the vegetable garden, Rose is (appropriately) all about the flowers. She often checks out books from the library which feature full-color photos of roses and fills the pages with little papers, marking her favorites. I love that about her. This lovely flower is a climbing noisette from France, introduced in 1879. It's described as vigorous, nearly thornless, and having a wonderful fragrance. 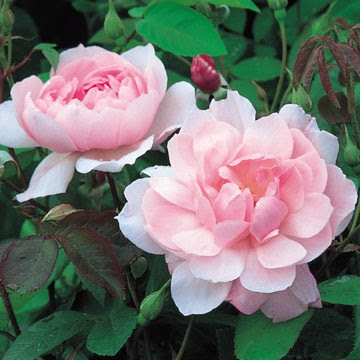 It blooms continuously through the season with buds that open pale pink, then go through stages of cream and white. 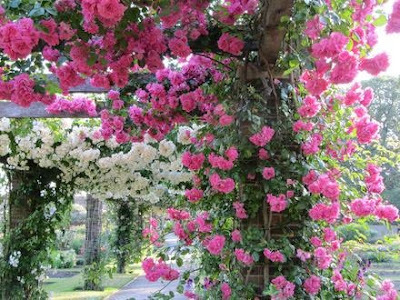 It will climb our dining trellis, replacing our Cecile Brunner that sadly met its demise of some unknown rose disease. Hopefully it's not a doomed spot. Apparently Mme. 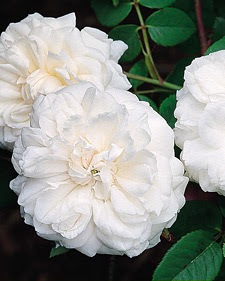 Alfred Carriere is a very hardy, disease resistant rose, so we'll keep our fingers crossed. This is another old rambler rose, also from France, introduced in 1909. It's a once-bloomer, but apparently so magnificent during those few weeks that you can forgive it during the rest of the year. It's described as very fragrant and extremely disease resistant. It will go against the back of the house and climb the porch railing up onto the roof. 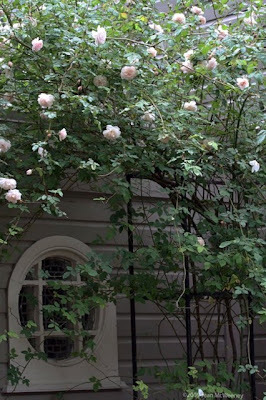 The dark pink blooms should look lovely against the white house. Can't wait to see it. I can't believe this lovely specimen is named Mortimer Sackler. Does it look even remotely like a Mortimer? I don't think so either. Anyway, Rose begged for a classic-looking bubble gum pink rose. That sounded great to me too, but I required minimal thorns, great disease resistance, and in this particular location, shade tolerance. We spent hours trying to find the one rose that would fit the bill, and lo and behold, Mortimer had it all. It's a new David Austin rose, introduced in England in 2002, so I couldn't find many reviews, but we're willing to give it a go. In a few years, these babies should be spectacular. In the meantime, our Autumn Sunset rose is filled with buds and should be impressive come Rose's birthday in June. Wow-those are gorgeous! 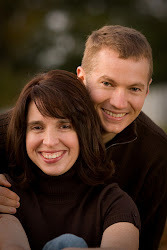 I wish I could see them in person at your home. I hope they have a long, healthy life in your yard. I love flowers too!! !